Turtlehead Mountain, known more commonly as Turtlehead Peak, is a detached summit of the La Madre Mountains in Red Rock Canyon National Conservation Area, formed of greyish limestone, and rising 2,000 feet above the flattish desert below, part of which is covered by much lower though more colorful hills of red/white Aztec sandstone. 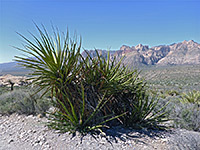 The higher peaks of the main part of the mountains are over two miles away so there is nothing to block the panoramic, 360 degree views over the whole park, and southeast towards Las Vegas. Turtlehead is the highest point easily reached by hiking in the park, so the 2.5 mile trail to the summit is popular, though not quite as much as might be expected, due to its steepness. Most of the elevation gain is achieved over the final 1.5 miles, across rocky slopes with patches of loose stones in some places. The round trip can be done in as little as two hours, however. The trail itself is perhaps not the most exciting in the area, as the peak, and the course of the whole route, is visible from the start, and the views do not change so much along the way. 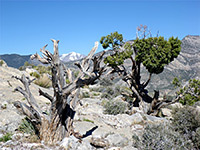 20 views of Turtlehead Peak. 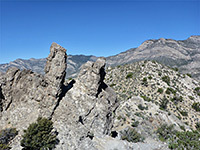 Panorama from the summit. Full screen version (17 mb). 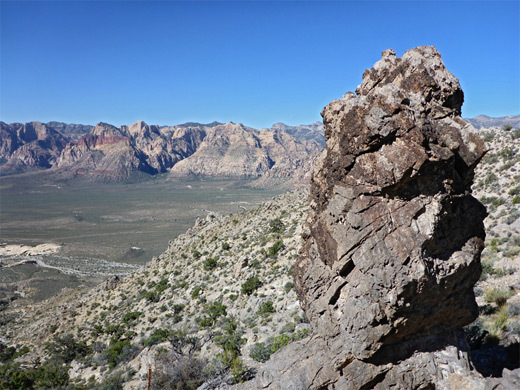 The hike to the summit starts at the Sandstone Quarry trailhead, the same place as for the Calico Tanks Trail, and also for the 12 mile Grand Circle Loop. The parking area is comparatively large but still fills up early at busy times. 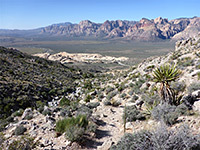 The trailhead sits beside a wide, gravelly streambed, an unnamed tributary of Red Rock Wash, at the foot of a red section of the Calico Hills, and is named after a disused quarry a short distance north, where the rocks are mostly yellow-white. The path heads in this direction, right past the quarry, recognizable from several dozen abandoned blocks that are piled up in front of the excavation area, all gradually becoming overgrown with bushes. 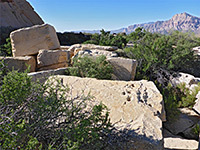 It then crosses to the west side of the wash and forks; right is the rather wider path to the Calico Tanks, while the Turtlehead Peak Trail is left, following a secondary channel of the wash close to a low sandstone ridge to the west, which has a variety of eroded formations including at least one arch. A similar low ridge borders the opposite side of the wash. The ground is generally white, stony and dusty, and this area is very hot in summer. 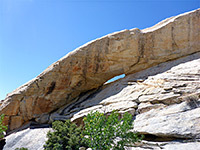 The trail crosses back east of the wash, passes through a gap near the north edge of the sandstone and sets off across an open plain, rising gradually to the top of a little ridge marked by a patch of yucca, then climbing further to the base of a notably steeper slope, and start of the main part of the ascent; 700 feet up a stony hillside, with some switchbacks but mostly straight. Some parts are slippery because of loose rocks, more of a problem when descending. The slopes are arid and exposed so wildflowers are limited; a better selection is found amongst the lower ground, around the wash. The steep climb, up the side of a minor gully, leads to a narrow ridgeline northwest of the summit where the limestone has eroded to form a few pinnacles and other jagged shapes, while the final section, gaining another 400 feet, is a little less steep, and runs close to a sheer drop-off to the west. The last section of the path is less well-defined, sometimes splitting into several routes, but the terrain is straightforward so the precise course is not so important. At the summit, the ground falls most steeply to the south and most gently to the north, down to the upper end of Brownstone Basin.